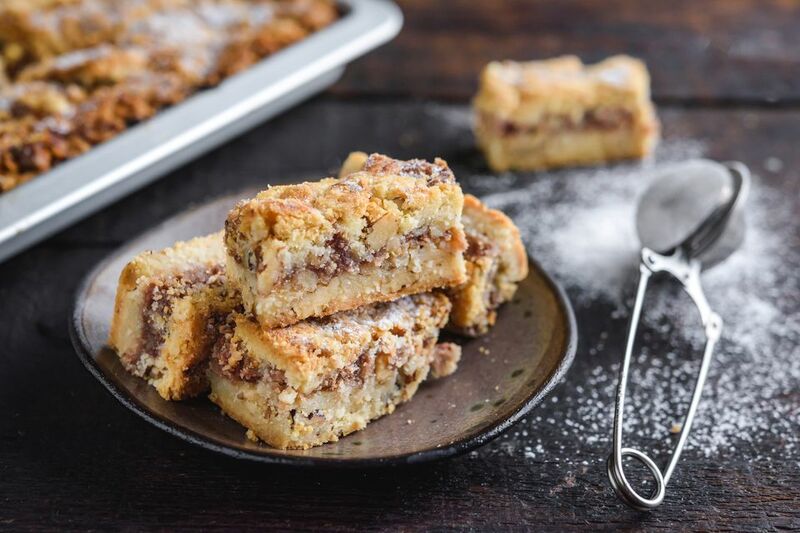 This Czechoslovakian shortbread bar cookie recipe would be considered a cukrovi (the generic term for confections or sweets of any kind) as well as a susenky (a cookie, shortbread and biscuit as the English use the word. Czech Christmas cookies are known as vánoční cukrovi. Everyone seems to have it a version of this recipe, but not with an almond-strawberry filing. The almond, while very sweet, actually cuts through the richness of the dough. This recipe is definitely party size, but it can be cut in half with no loss in quality. This recipe calls for 4 egg yolks, so freeze the leftover egg whites and save them to use in these leftover egg white recipes. Gather the ingredients. Preheat oven to 325 F.
Add the all-purpose flour and chopped walnuts and mix until well incorporated. Divide the dough in half. Wrap half in plastic and put in the freezer while you make the base. With slightly dampened hands, pat the remaining half of dough into a 15.5x10.5-inch jellyroll pan until even. Re-dampen hands as necessary if dough starts to stick to your fingers. Spread almond paste over surface to within 1/4 inch of edges. Top with strawberry filling and spread in the same way. Remove dough from freezer and grate evenly over the entire surface of filling. Bake for 45 minutes to 1 hour or until golden brown. While still in the pan and warm, cut into nine horizontal rows and six vertical rows to make 54 bars. Cool completely in the pan. Dust with confectioner's sugar and transfer bars to paper cups and a pretty serving tray. Store any leftovers tightly covered container.